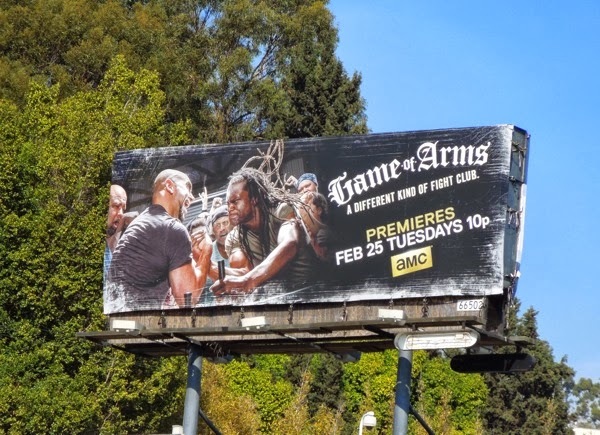 Another year and another new TV season for studios and networks to get audiences to believe in their new offerings. 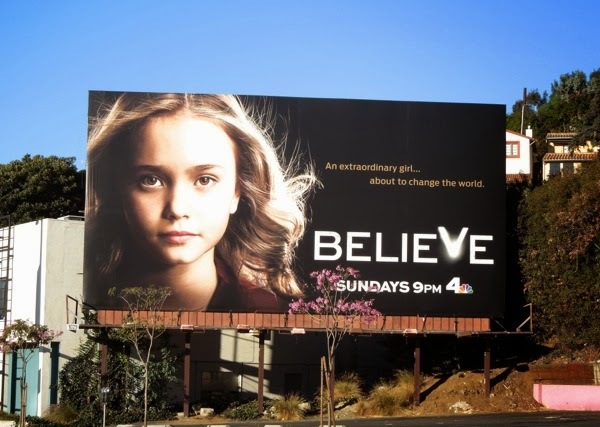 This midseason NBC will premiere Believe, its new fantastical drama from J. J. Abrams and Alfonso Cuarón. 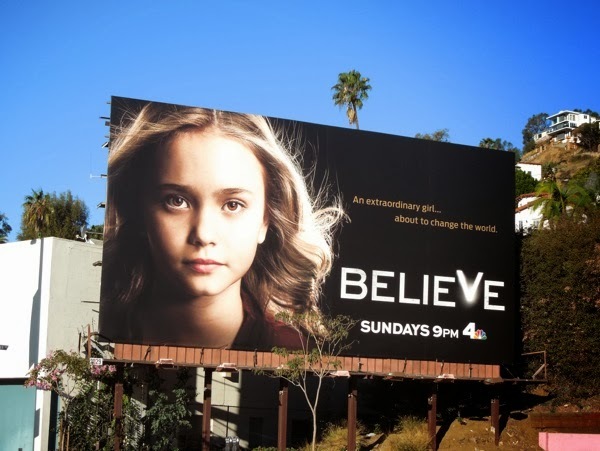 The pretty young face of Believe is played by Johnny Sequoyah as 'Bo', a mysterious and gifted girl (even though the actress seems to have a boy's name) who is fleeing from assassins and sinister forces pursuing her and her unlikely ex-con guardian, 'Tate' (Jake McLaughlin). 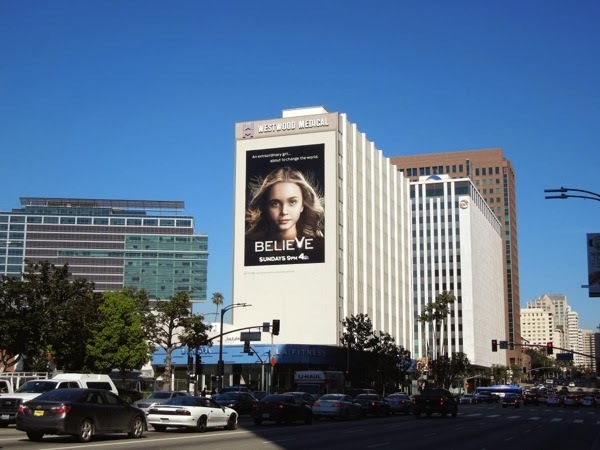 Born with abilities like telekinesis, precognition and control over nature, this 10-year-old is on the run from dangerous people who want to use her powers to control the world. 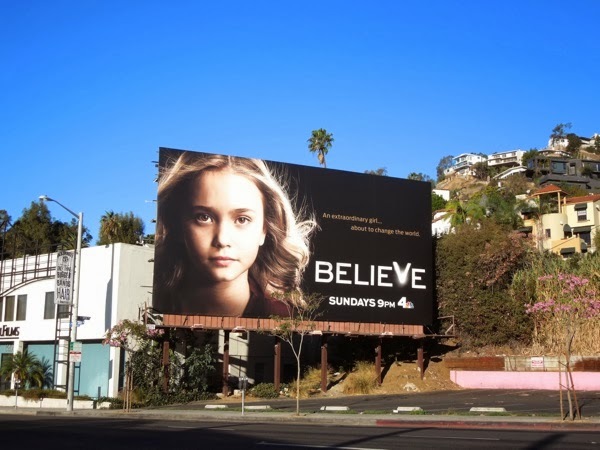 The standard landscape billboard for Believe was first spied along Highland Avenue on February 1 and the larger, more striking version, was spotted along Sunset Boulevard on a brighter February 3, 2014. 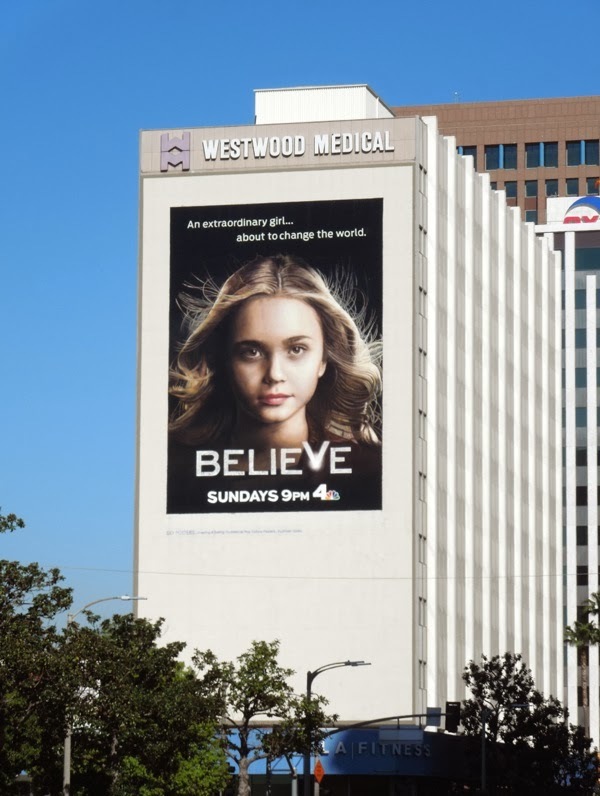 This series launch ad creative evokes a young Drew Barrymore in the 1984 cinematic adaptation of Stephen King's Firestarter, which was also about a little girl with paranormal powers. 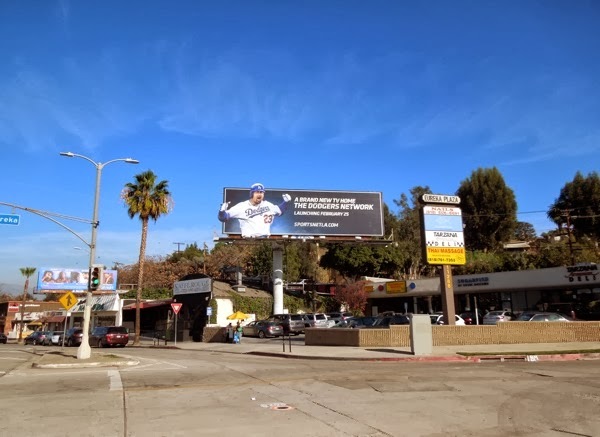 Let's hope this child star can handle the fame and Believe doesn't crash and burn upon arrival. 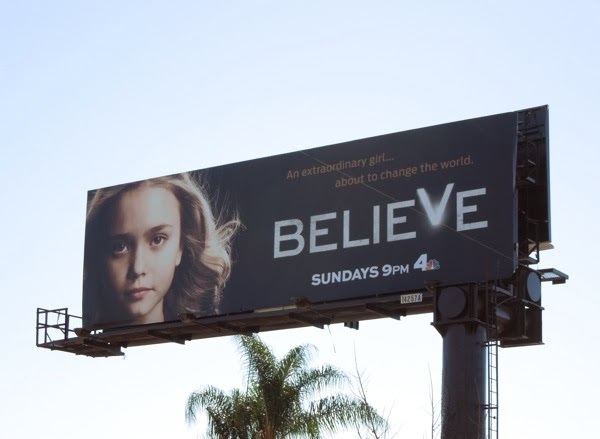 UPDATED: How amazing must it be for young Johnny Sequoyah to see herself super-sized on this series launch billboard for Believe. 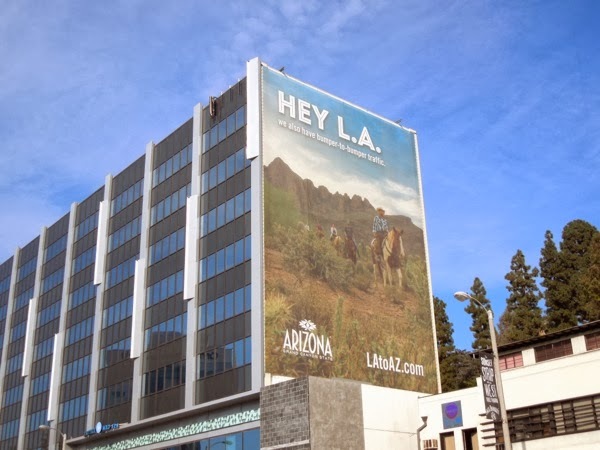 This giant striking wall mural was spied along Wilshire Boulevard in Westwood on March 10, 2014. One thing's for sure, the world's going to change for this extraordinary girl. 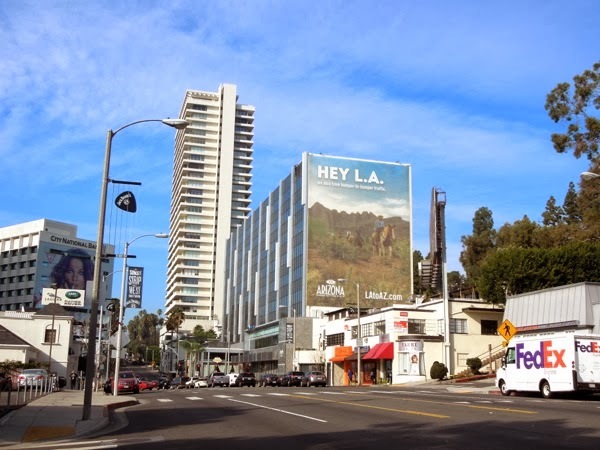 In last season's NBC sitcom partially based on the actor's own experiences, The Michael J. 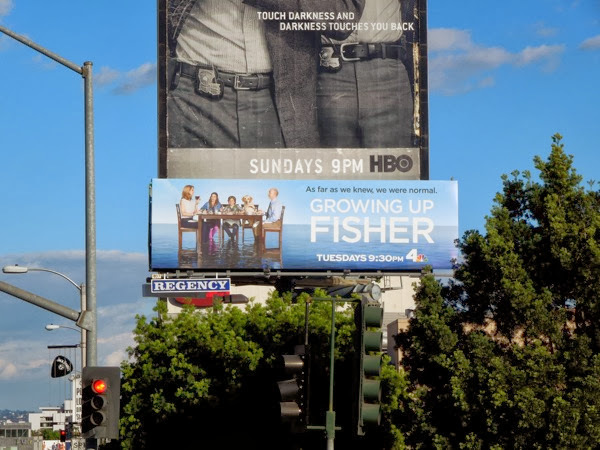 Fox Show, we saw the actor and his on-screen family living life and trying to revive his career with Parkinsons. 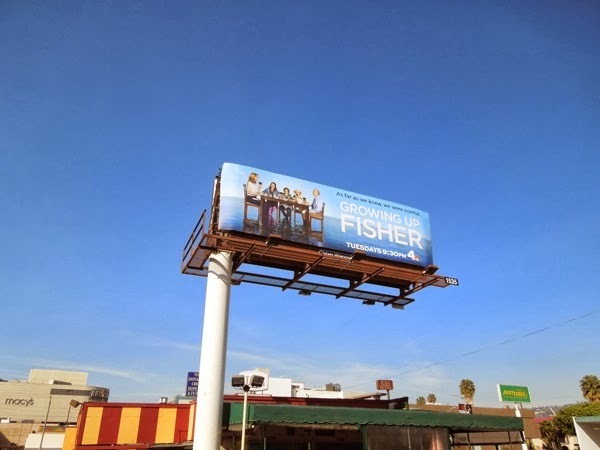 That show has recently been cancelled and it looks like Growing Up Fisher may be its successor, as the sitcom stars J. K. Simmons as a blind lawyer and a family man in the middle of a divorce. 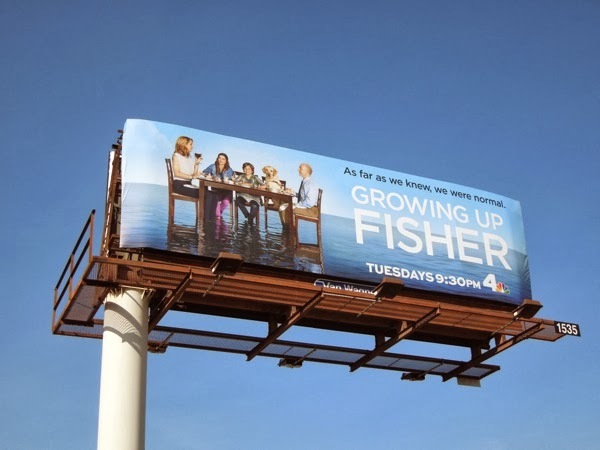 The new comedy is semi-autobiographical and based on the childhood of the show's creator, D. J. Nash, and his own father. 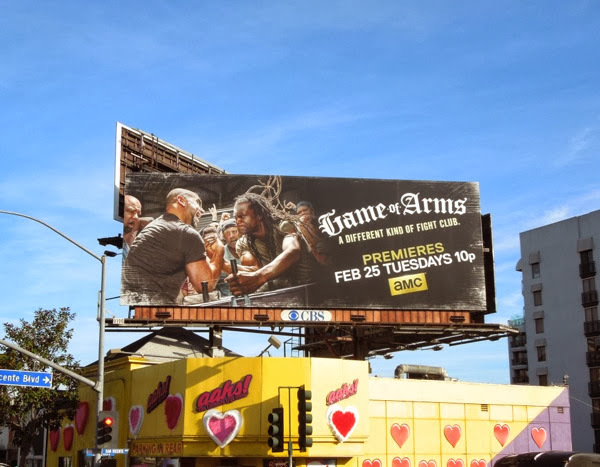 Told from the viewpoint of the grown up son, who as a child helped his father 'see' for years, the show is narrated by Jason Bateman. 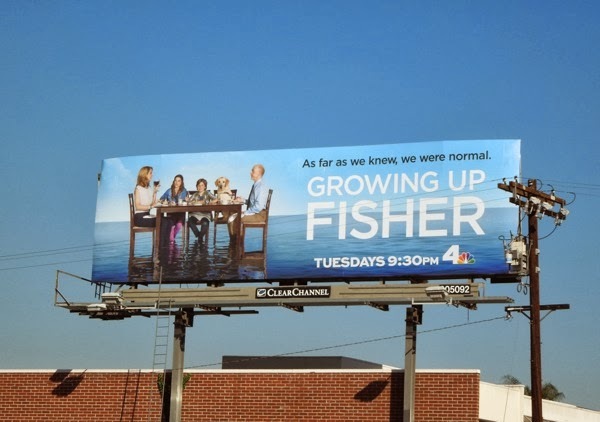 Yellow labradors aside, looking at the ad creative for Growing Up Fisher from a distance you'd never guess it was about a blind man, or about divorce, as J. K. Simmons and Jenna Elfman look like a typical, happily married couple sitting down for a meal with their 'normal' family. 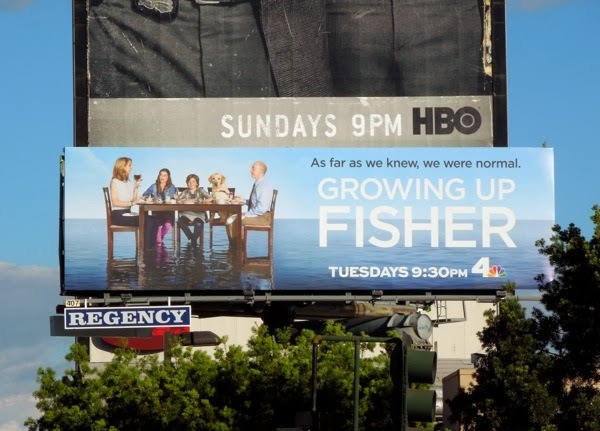 Up closer you can can see J. K. Simmons has his eyes closed and his dog has a harness like a guide dog, but they still look like an average family, even if their table is in the middle of an ocean (or body of water of some kind), at least that hints at something more out of the ordinary. 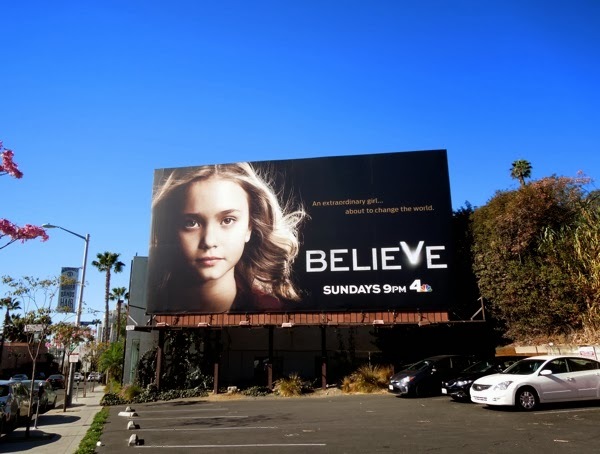 These intriguing billboards for the debuting NBC series were spotted along Sunset Boulevard on February 3, Beverly Boulevard on February 11 and Ventura Boulevard in Sherman Oaks on February 21, 2014. 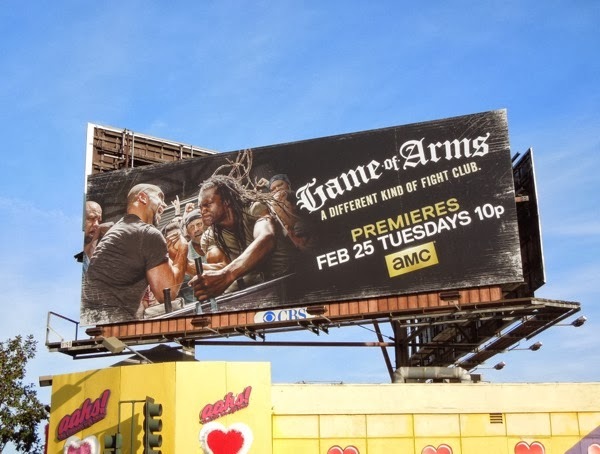 Only time will tell if this new sitcom will grow on audiences, or it will sink without trace after a couple of episodes. 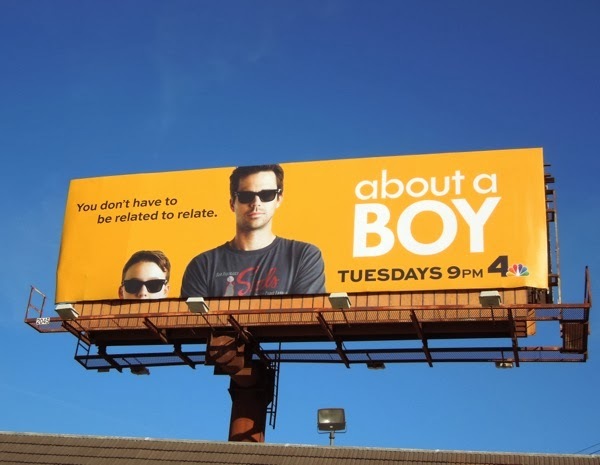 NBC is plundering the cinematic vaults yet again this 2014 TV season to try and find new comedy gold. 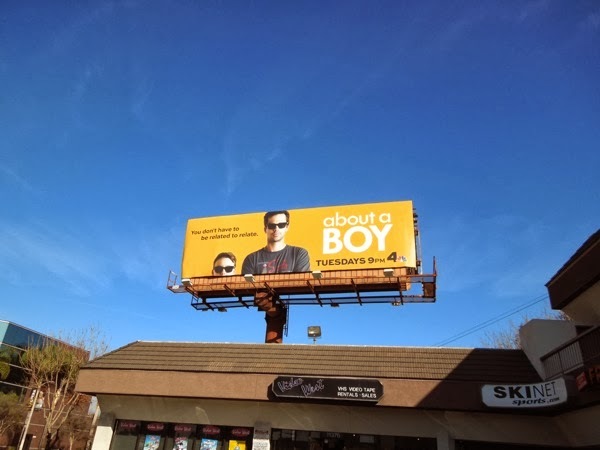 This time the network is remaking the 2002 movie About a Boy, which starred Hugh Grant and a young Nicholas Hoult, based on the best-selling book by Nick Hornby. 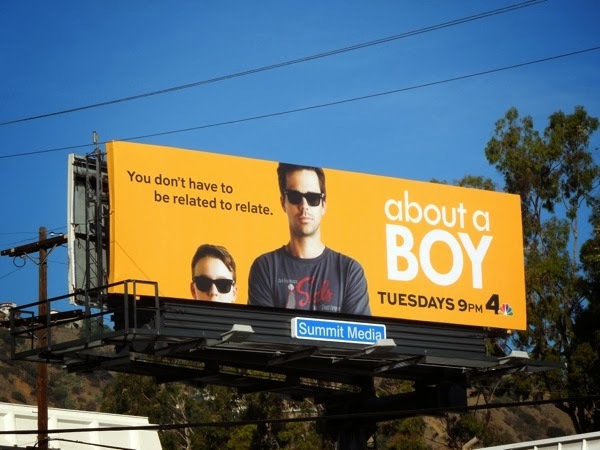 This iteration stars David Walton (recently seen on New Girl and in the failed 2012 sitcom Bent) as 'Will Freeman', a single guy who has been granted a life of free time and no financial woes after writing a hit song, but whose perfect world is disrupted by his new needy single mom neighbour (Minnie Driver) and her oddly charming 11-year-old son, 'Marcus' (Benjamin Stockham). 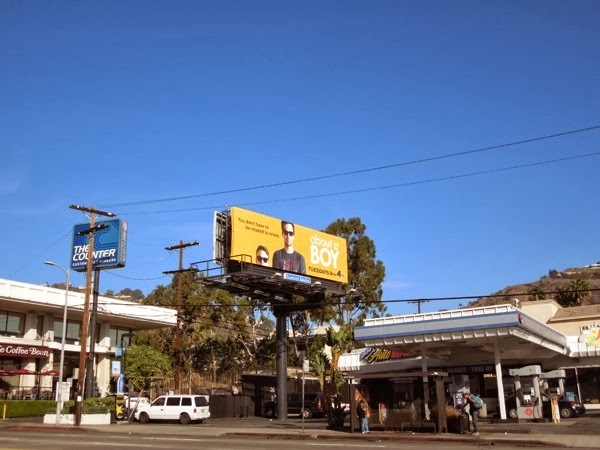 This simple, yet endearing 'father and son' style creative, with the 'boy' in question mimicking his new grown up neighbour in the same type of sunglasses, was snapped along Ventura Boulevard in Studio City on January 29, plus along Sunset Boulevard at Fairfax Avenue on February 17, 2014. 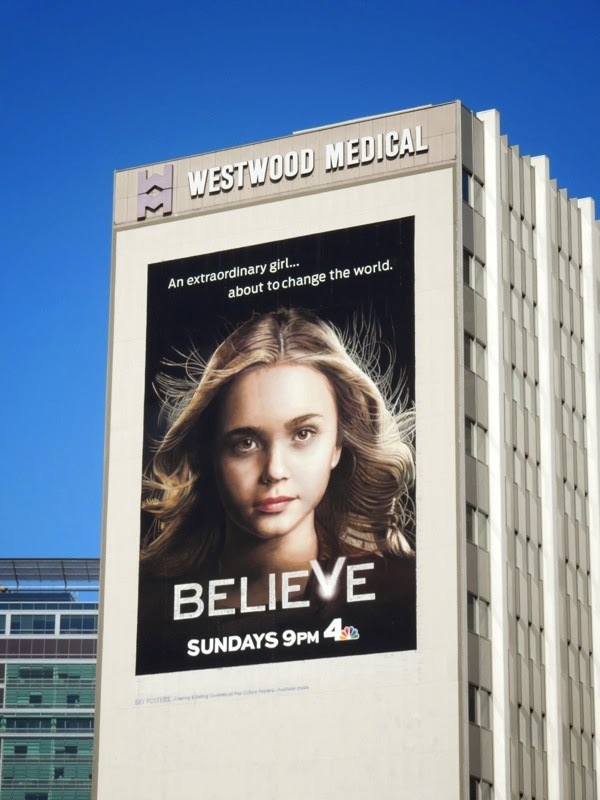 NBC's recent remake of the Ironside TV series was a big flop, whilst the future of last season's Dracula, starring Jonathan Rhys Meyers as the titular vampire, is also looking uncertain. 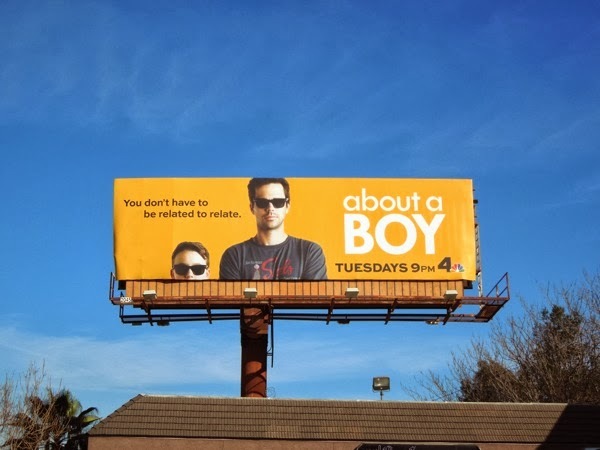 Let's see if audiences have the patience for one more remake, and this new sitcom isn't just another waste of time due to lack of imagination. 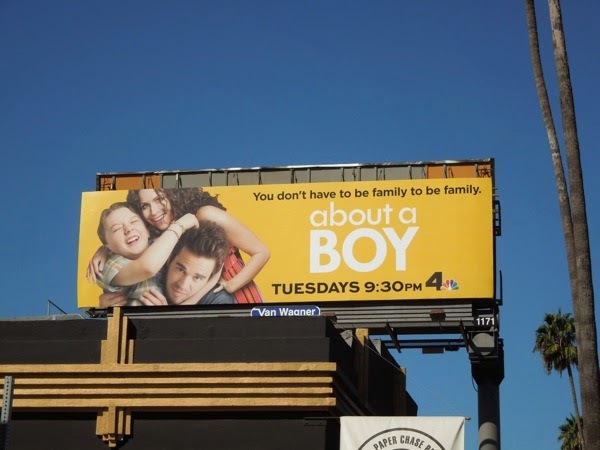 UPDATED: NBC's About a Boy TV remake was one of the lucky sitcoms to secure a second season and as you can see from the promo billboard Minnie Driver is getting in on the action this time around. 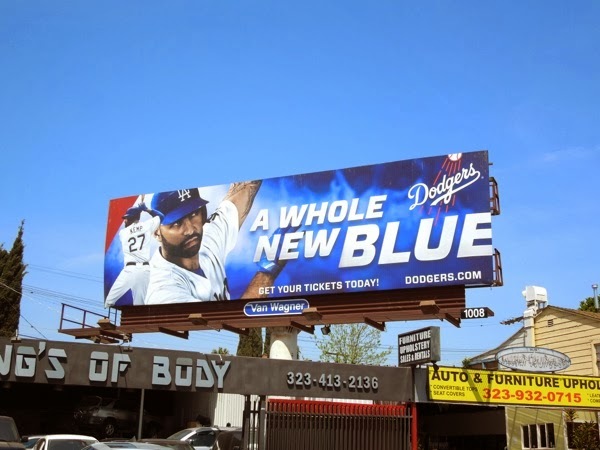 This sophomore season billboard was snapped along Sunset Boulevard on September 24, 2014. 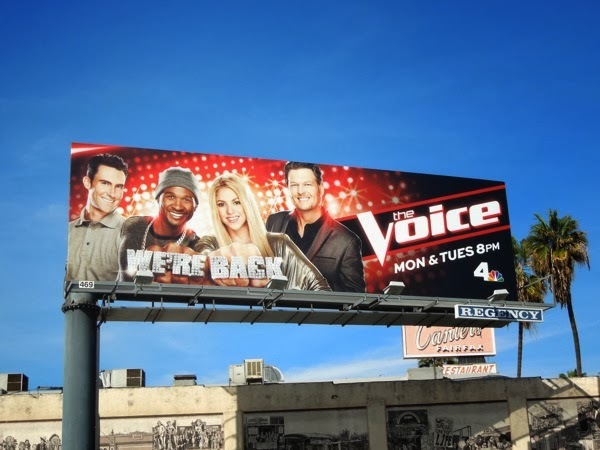 Usher and Shakira are back on The Voice and it looks like one of them may be staying for good, as original judge, Cee Lo Green, has announced he won't be returning to the spinning red chair. 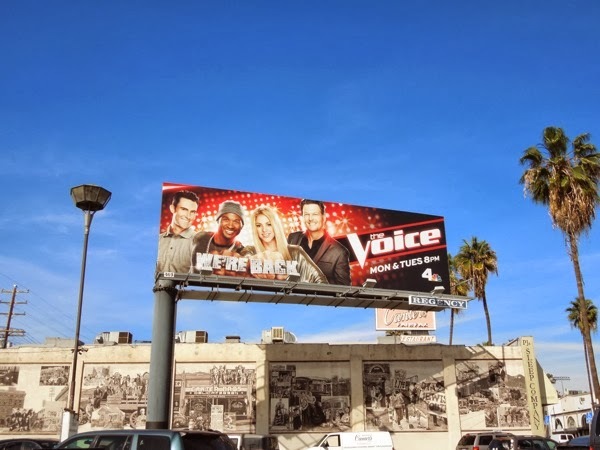 The duo originally joined Maroon 5's frontman Adam Levine and country star Blake Shelton as temporary replacements for Cee Lo and Christina Aguilera for the fourth season, when the two original mentors of the U.S. version of The Voice took a break. 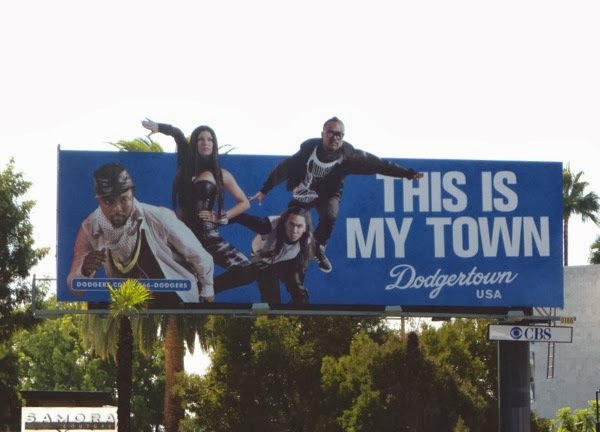 Now will one of these recording artists replace the Gnarls Barkley singer permanently, or will we see a totally new face in the judge's chair? 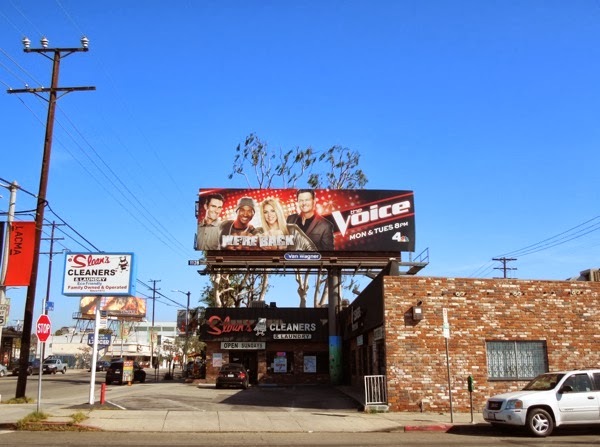 Here's the thing though, the more this talent contest focusing on its judges, the less important the contestants become and finding the best voice. 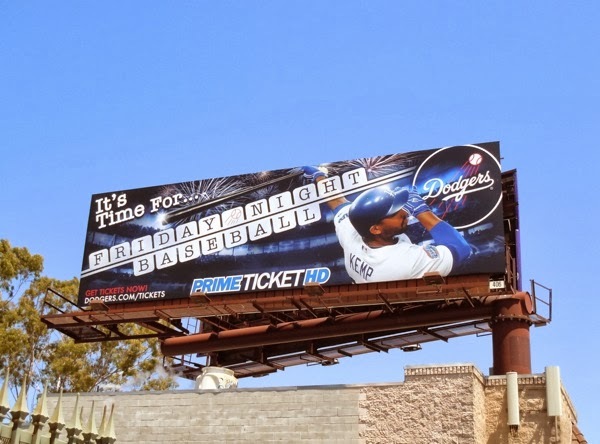 Isn't that what went wrong with American Idol? 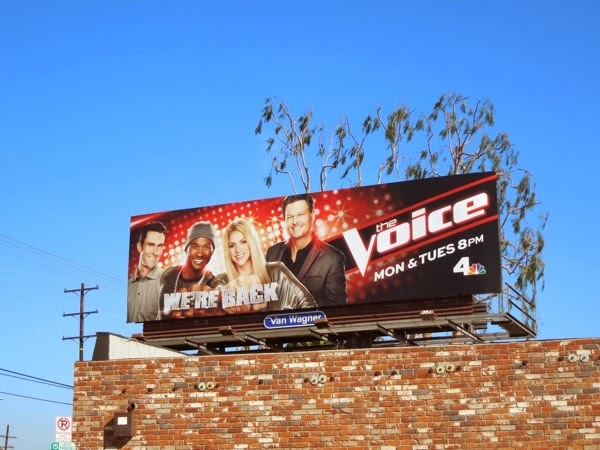 These 'We're back' season six billboards for The Voice were spied along L.A.'s 3rd Street on February 10, 2014, plus along Fairfax Avenue two days later. 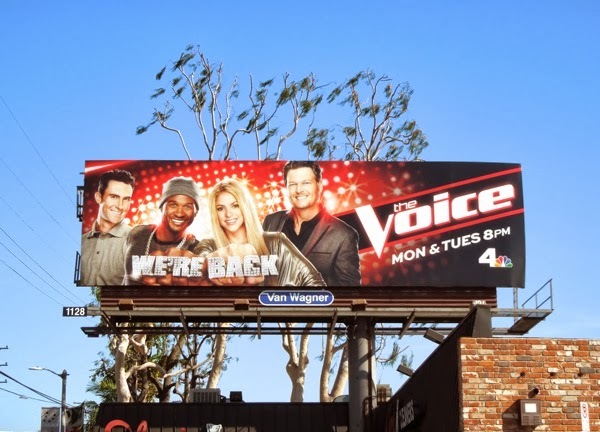 If you're a fan of the show, be sure to also check out all the previous season billboards for The Voice, here at Daily Billboard. 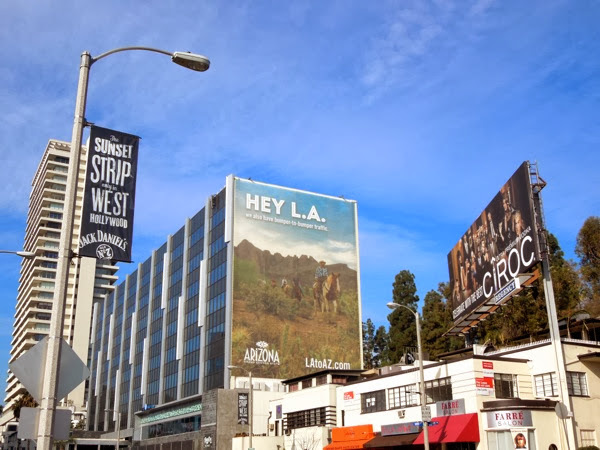 Stick around for another TV WEEK and enjoy the new ad creatives for this season's debuting shows and more returning favourite series. 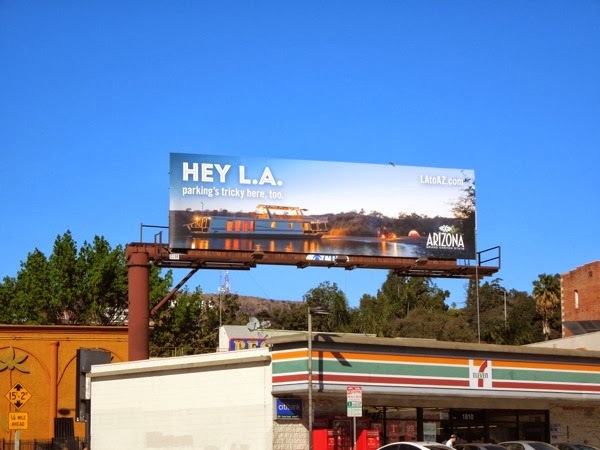 With Arizona only being a short 45 minute flight away from L.A., it makes sense for The Grand Canyon State to advertise to Los Angelenos in an attempt to drum up some tourism. 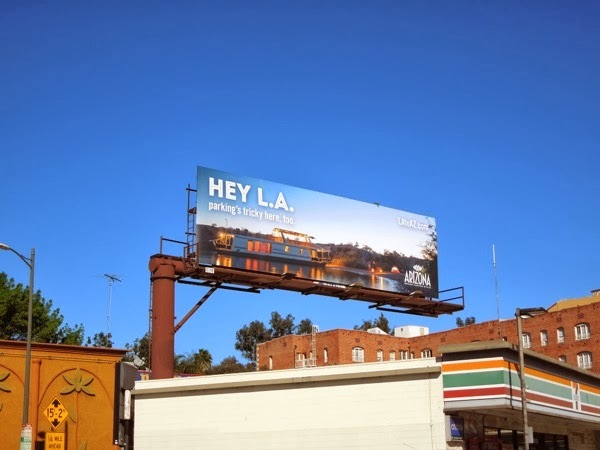 These witty tongue-in-cheek billboards poking fun at L.A.'s notorious car culture problems, like rush hour traffic and parking, are a clever way to get a reaction, be it a wry grin or a disdainful shake of the head, from local passersby in their cars or on foot. 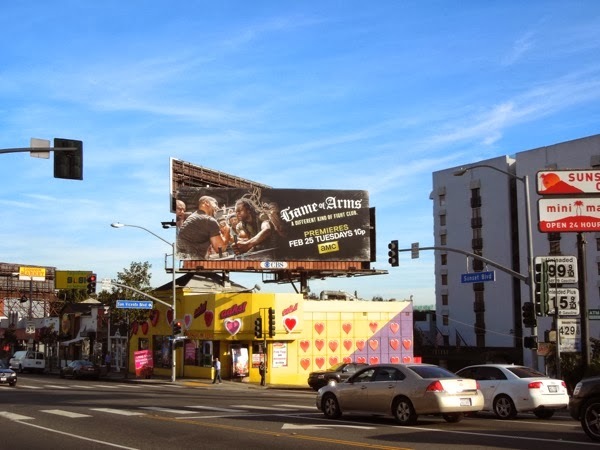 The giant 'bumper-to-bumper traffic' billboard version was spotted along West Hollywood's Sunset Strip on January 10, whilst the 'parking's tricky' ad creative was spied along Cahuenga Boulevard in Hollywood on February 1, 2014. 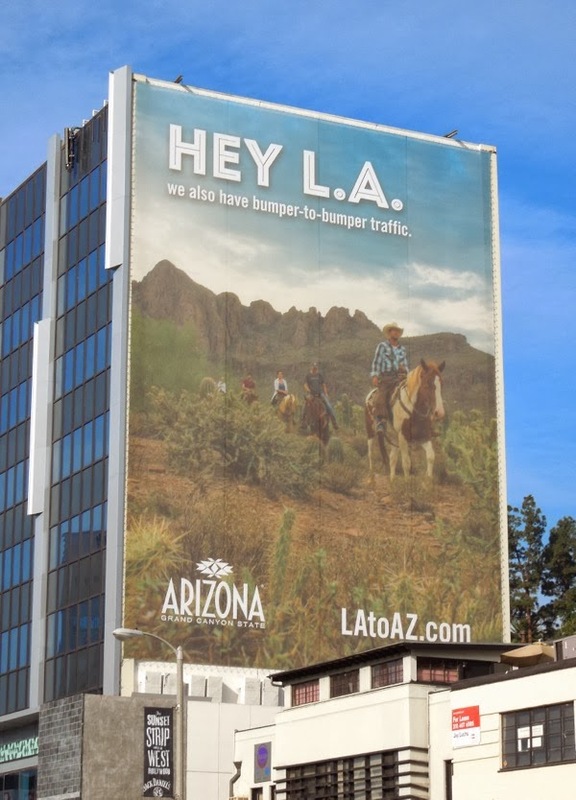 That's certainly great media buying as both billboards are in major commuter zones, with motorists who have plenty of time sitting in traffic to be tempted by the prospect of adventurous horseback riding or boating along peaceful rivers, rather than being stuck in gridlock hell. 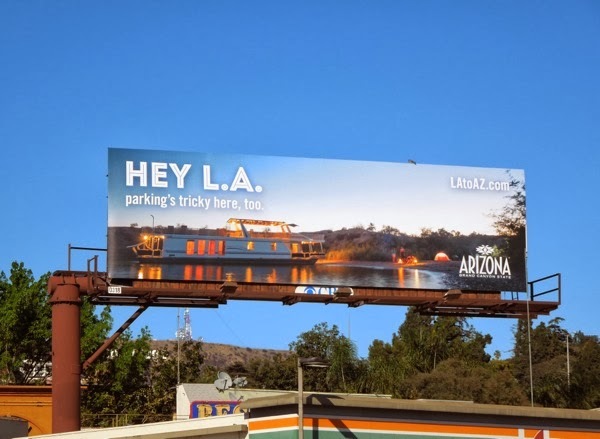 It's also nice to see the advertiser talking directly to the local audience, with more than a degree of understanding of local conditions, and using humour to sell its offering. 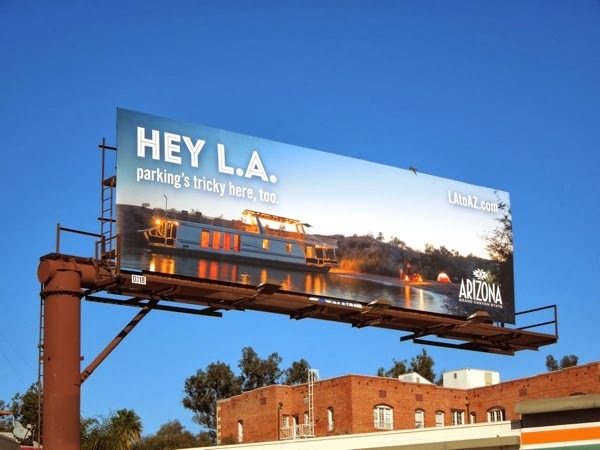 For more examples of how other U.S. States and other countries advertise themselves, be sure to check out these other travel and tourism ad campaigns, including billboards promoting Utah, Great Britain and Turkey as travel destinations, to name just a few. 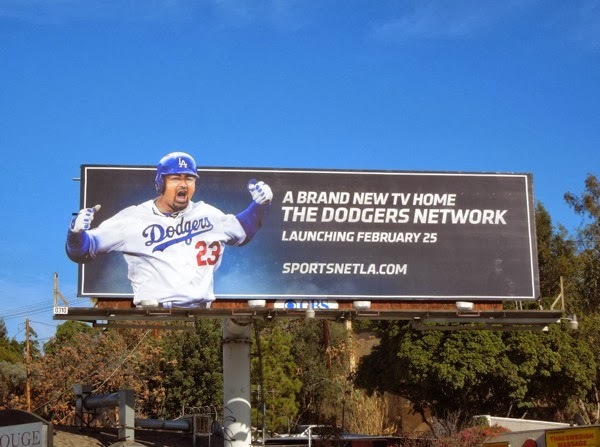 Dodgers fans are in for a treat this year from February 25, 2014, with a whole new TV network dedicated to their favourite baseball team on SportsNet LA. 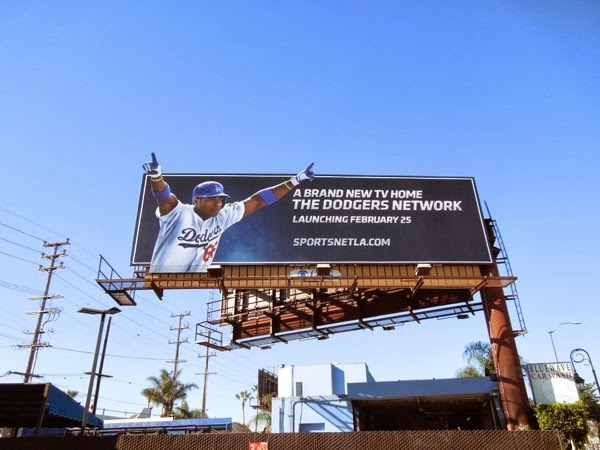 The Dodgers Network will not only televise Spring Training games daily, but will also take supporters behind-the-scenes and offer in-depth access to the sporting organization, providing lots of new and never-before-seen content and thousands of hours of Dodger programming. 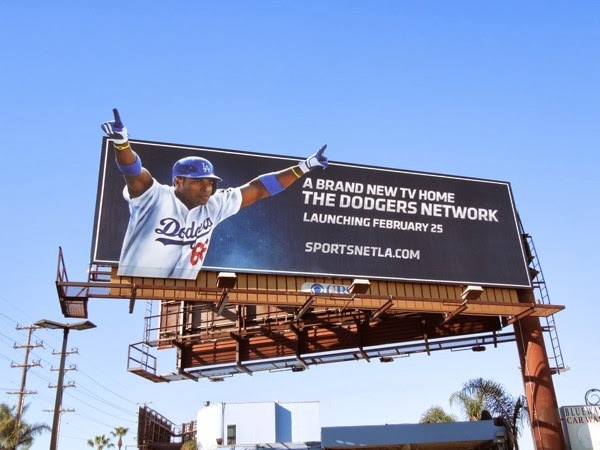 These sporty special extension billboards for the new network launch, featuring players like Yasiel Puig, Clayton Kershaw and Adrian Gonzalez, have sprung about around L.A. at the start of the year, along Santa Monica Boulevard in Westwood, Holloway Drive in West Hollywood and Ventura Boulevard in Studio City, snapped from January 29 to February 14, 2014. 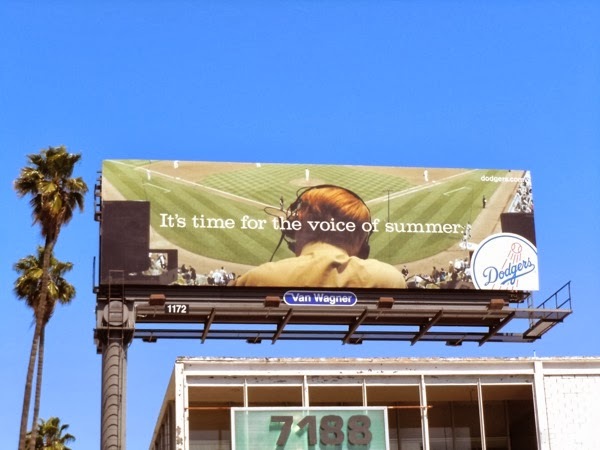 The fortunes of the L.A. Dodgers certainly seem to be improving (at least off the ball field) since the bankrupt team was bought from owner Frank McCourt in 2012 by the Guggenheim Baseball Management team, which included former Lakers star Magic Johnson and former Atlanta Braves and Washington Nationals President Stan Kasten, for a record $2 billion. 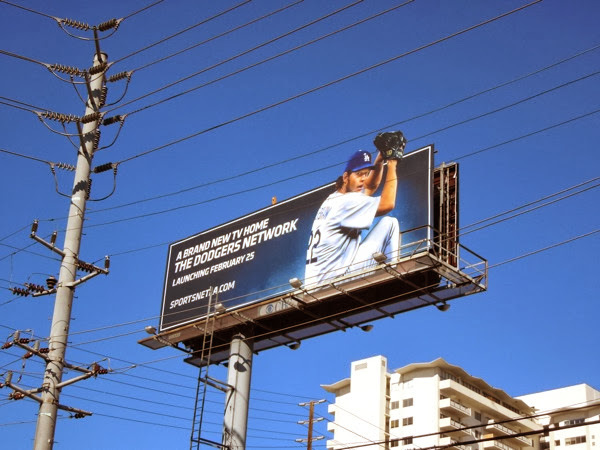 As you can see from this array of billboard creatives from recent years, the Dodgers have had several different ad campaigns to help drive attendance and interest in their games. 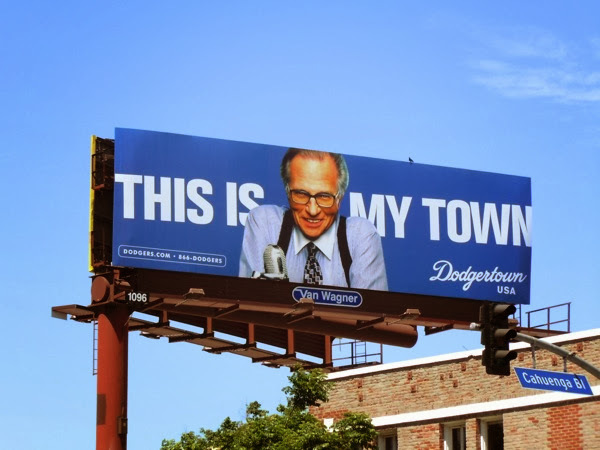 The team have tried everything from overtly baseball-themed ads to the 'This Is My Town' Dodgertown campaign which ran from 2009 through 2010 and featured actual Dodgers baseball players, plus a variety of celebrities, from famous TV personalities like Larry King, to musicians like Alice Cooper, Motley Crue and the Black Eyed Peas, and more besides. 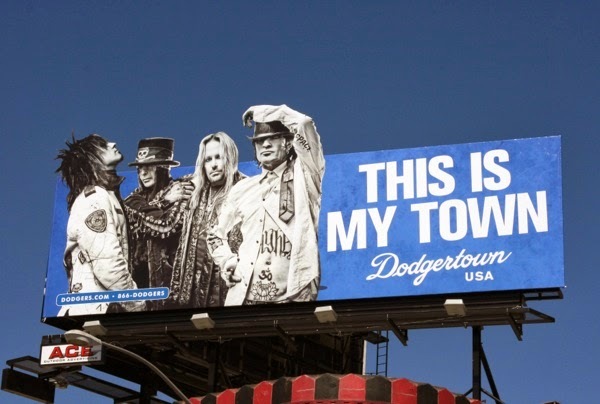 Be sure to also check out these Dodgertown billboards featuring The Osbournes and guitarist Slash from along the Sunset Strip in August 2010, and even a specially enhanced glittering lightsaber Dodgertown billboard featuring Yoda from Star Wars from July 2009. 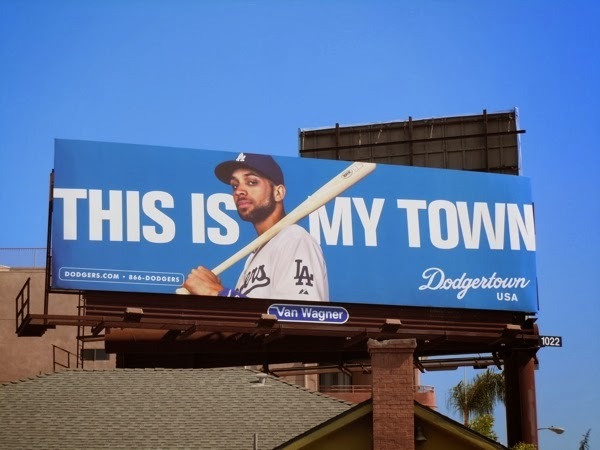 The objective of the out-of-home campaign was to generate interest and excitement for the upcoming season amongst all of Los Angeles' diverse cultures and communities, all ages, all genders and races, and make them all feel like this was their town they were and should be supporting. 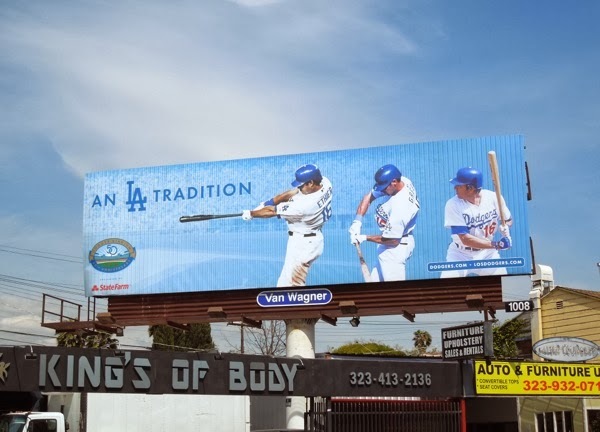 You can find out more about the aims and execution of this previous L.A. Dodgers campaign courtesy of Lamar Advertising. 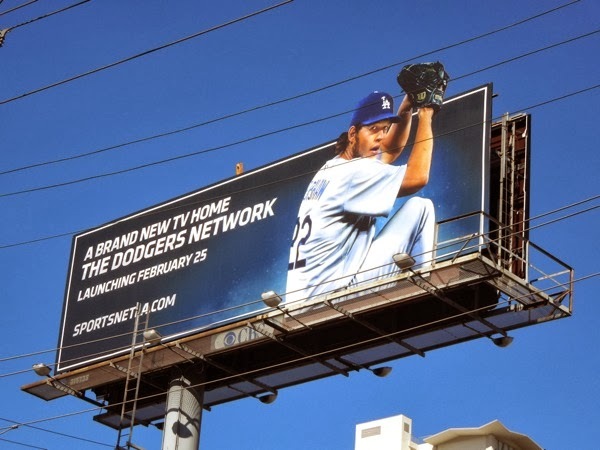 The new ad campaign for The Dodgers Network certainly seems to be going back to the team's roots, showcasing the players and the Dodgers traditional blue and white colours in a big way, plus they manage to capture some of the action and excitement of baseball with their choice of images. What do you think? 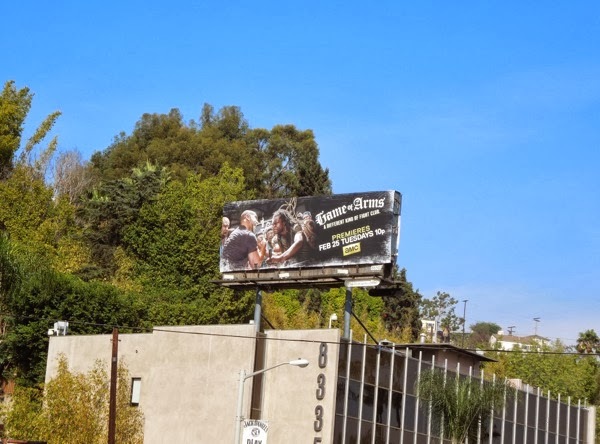 Will you 'Live. Breathe. Blue.' 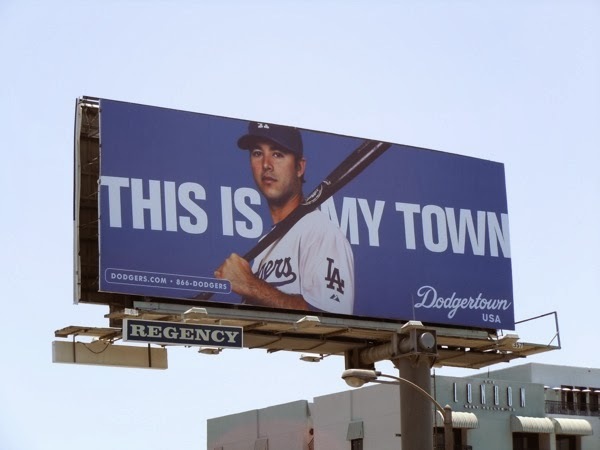 with the L.A. Dodgers in 2014?